In this corner, we have the number 1 contender, Auto-sort, versus the champion, Macros, in a title bout for the “Most User-friendly APBA Football Standings”. In this title bout the APBA Football community is the winner because both methods are tremendous timesavers. I’m always looking for ways to improve all facets (preparation, method of play, data input and reporting) of my replays and am blessed to have really smart friends. Denny Hodge created the auto-sort version and my APBA Football brother, Mark Zarb, created the macro-version. These standings are designed to use in conjunction with the team workbooks that I posted a few days back. All you have to do is link each teams win, loss, tie, points scored and points allowed to the template. If using the auto-sort workbook, just link to gray-colored section. Usage is very simple, for the auto-sort just open the file and the standings automatically adjust for each team’s winning percentage. For the macro version, just simultaneously press CTRL R keys and each divisions winning percentage is sorted. Press a second time and each divisions win record is sorted and press a third time and each division is alphabetically for teams with identical records. These functions happen a mind-numbing speed. I know which one is my favorite but they are both winners in my book! Unfortunately WordPress doesn’t allow macro files to be inserted into a post but if interested email me at greg.barath@oguard62.net and I will send you the file. After corresponding via email and “Between the Lines” forum countless times over the years, it was an absolute joy to finally meet Mr. Denny Hodges (a.k.a. Zinnastone). This past Saturday morning I found myself deep in thought worrying about my ailing mother and my wife’s upcoming scan, when all of a sudden someone touched by shoulder and I turned around to see Denny. 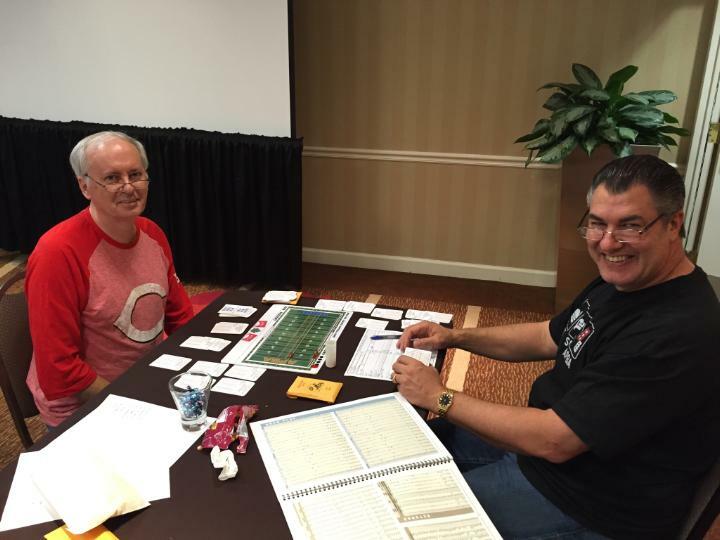 From that moment my day instantly improved, we headed down to the tournament room for a day filled with APBA Football, some good conversation and a lot of laughs. Denny hadn’t played a face-to-face game for several decades, so we started out with the Basic game. He used his homebrewed 1963 Cleveland Browns and I used the 1993 Dallas Cowboys. I forgot how good that Dallas team really was with their 45 rated offense and 42 rated defense, however, Cleveland’s tandem of Jim Brown and Ernie Green each averaged over 6.0 yards per carry. Denny’s ice cold dice coupled with Dallas’s four “A” rated receivers proved to be too much for the Browns. Jim Brown soon realized the defenders in 93 were slightly bigger and faster than their counterparts of 63. Jim Brown was held to nine-yards on eight carries and as a team, they finished with 27 yards on 14 rushing attempts. Frank Ryan had a decent game, going 8 of 18 for 179 yards and two touchdowns. But the difference maker of the game was Troy Aikman, he was 36 of 41 for 335 yards with one touchdown and one interception (which came off the penalty boards). Within the final five minutes of the game, I was telling Denny how Emmitt Smith was complaining because he was stuck on 99-yards. If you don’t know Denny, he is a very reserved and thoughtful gentleman, however, he looked at me and said “Emmitt is NOT breaking a hundred.” Needless to say, I knew what the defensive play call was going to be, “Standard, G alignment, key Smith”. Emmitt lost four yards on his next carry and only gained four yards on his next seven carries to finish the game with 98-yards. Well now it was time to graduate to the Master game, so I let Denny take the 2011 New England Patriots and I took the 2011 New York Jets. The first half was a defensive struggle and the Jets entered the locker room at halftime with a 9-0 lead. I started to feel really good about my chances after Shonn Greene scored a 4-yard rushing touchdown to put the Jets up 16-0 early in the third quarter. All of a sudden a funny thing happened, Denny started to master the line changes and with it his dice heated up. To put it bluntly, he was unstoppable. Tom Brady completed 23 of 41 attempts for 357 yards with three touchdowns. Wes Welker and his A* rating finished with six receptions for 164 yards and one touchdown. Deion Branch had eight catches for 142 yards and one touchdown. The Jets were penalized 13 times for 134 yards with the majority occurring in the second half. Mark Sanchez finished with 23 completions on 35 attempts for 184 yards and one interception, however, he guided the Jets to 20 first downs. The forgotten aspect of the game, Special Teams, proved to be the difference in the game. Steve Gostkowski missed a 45-yard field goal and Nick Folk made four of five attempts. The Jets punter, T.J. Conley, averaged 50.4 yards per punt and Joe McKnight returned a kick 102-yards for a touchdown.